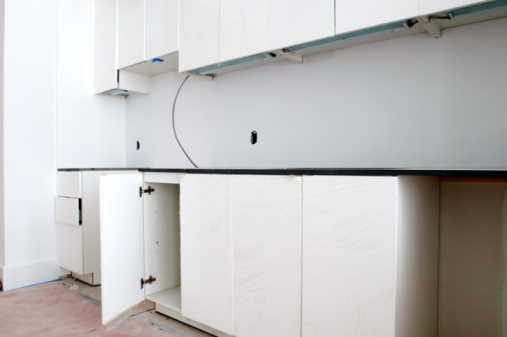 A slamming cabinet door is quite disruptive and can eventually damage it or the cabinetry. Self-closing cabinet hinges prevent doors from slamming. When a cabinet door is forced closed, self-closing hinges catch and slow the door down, then gently guide the door to a close without slamming. If the self-closing hinges no longer work, the hinges could be stuck. If the cabinet doors are not aligned properly, one of hinge's adjustment screws is too tight or too loose. Tighten the screws in the self-closing hinge with a Phillips screwdriver. If any screw is loose, the cabinet doors can become misaligned and the self-closing mechanism will not function properly. Reinsert any screw that is missing; missing screws can have the same effect as loose screws on the hinge or door. Spray lubricant on the self-closing hinge if it is failing to close on its own. Over time, debris and gunk can get lodged into the parts of the hinge, which prevents it from being able to close. Wipe up excess lubricant off the cabinet with a dry cloth, and attempt to close the door. If the hinge still doesn't catch the door, unscrew the entire hinge and clean it. Fill a slow cooker with water and 2 tablespoons of liquid laundry detergent. Unscrew the hinge from the cabinet and put it in the slow cooker. Turn the pot on medium heat and allow the hinge to soak overnight. Any debris, gunk or paint will soften from the hinge. Then wipe the hinge clean. Loosen or tighten the adjustment screws on the self-closing hinge to change the placement of the cabinet door. Sometimes the door is slightly off-center, not aligned with the door next to it or has a gap between it and the cabinet. To fix this, find the adjustment screws in the center of the top or bottom hinge. One will move the door toward the left or right, another will move the door up and down, while another will move the door closer or away from the cabinet.